Cruise to Chester through Ellesmere's mini Lake District, the Meres or Lakes were carved out during the Ice Age. There is a wealth of things to do in the Roman City of Chester which can be seen on foot, because of the amazing survival of the old city wall. You can walk right round Chester on this superb footpath. Chester Roman Amphitheatre is the largest in Britain, used for entertainment and military training by the 20th Legion, based at the fortress of 'Deva' (Chester).Discover 1,000 of shops behind the façades of the black and white buildings, find high street brands to designer boutiques. Shop in Chester's Rows where 21st century stores thrive in a Medieval setting. Take home some Cheshire cheese which is one of the oldest recorded cheeses in British history and is even referred to in the Domesday Book. Lying outside the town is Chester Zoo is home to 7000 animals including some of the most endangered species on the planet. If you base yourself at Ellesmere on the first or last few days, Powis castle is only 25 miles away by car (30 minutes), this is the home to the Earls of Powis, and was built by the Welsh Princes in medieval times. Also only about 30 minutes away from Ellesmere is another National Trust property- an 18th century Regency mansion. Turn left out of the marina and soon you will see why this area is known as the mini Lake District, as you pass some of Ellesmere's Meres (lakes). The largest mere is off to the north just before Ellesmere Tunnel, but after the tunnel you pass the small Blake Mere, then off to your right is Cole Mere. The Meres were carved out during the Ice Age. The canal now passes through a very remote and underpopulated area, passing no villages for miles. Just past the lift bridge is Whixall Moss, a raised bog with rare insect and plant life, but there might be mosquitoes as well! The bog was also formed during the Ice Age. There are walks & cycle routes over Whixall Moss, see leaflets near bridges 44 & 45. Stop near Platt Lane bridge 43. It is 3 hours 20 minutes cruising to here & a good place to stop for the night. Another lift bridge is encountered at Bridge 42, and the Canal weaves its way through the quiet countryside until it reaches the town of Whitchurch, which is preceded by two lift bridges at 34 and 33. Another lift bridge marks the entrance to the Whitchurch Arm of the Canal, where you can moor to take the ½ mile walk to visit the town centre. Whitchurch is an old town dating from the Roman times and has some beautiful old houses of all periods in the town centre. There are lots of splendid pubs in the town, and shops & a swimming pool. Worth a visit is St Alkmunds Church, built in 1713 on a hill, it has a stunning interior and is on a grand scale. Leaving Whitchurch you travel up to the Grindley Brook Locks, these famous staircase locks have made this a canal monument. The 3 staircase locks are closely followed by 3 more locks, a friendly lock-keeper is on hand to help from April-Oct 8.30 am to 18.30. By the Locks is the Lockside Stores, selling local produce and with tea & coffee & snacks served in the adjacent cafe, which has internet access. The Canal travels again through quiet countryside only interrupted by the occasional lock- the 2nd of which has a Pub called the Willeymoor Lock tavern, formally the Lock keepers cottage, it contains some fine Canal paintings. ½ mile south from Marbury Lock is the enchanting village of Marbury. Further on is the village on Wrenbury, access can be reached from Bridge 20 or 19, about a ¼ mile walk. There are some thatched magpie cottages around the village green. The Dusty Miller pub is by the Lift bridge and the Cotton Arms is just down the road from the Bridge. It is just over 5 hours cruising from Whitchurch to here. From Wrenbury marina you will soon encounter a Lift bridge, if it is down you need to get your windlass out and let someone off the boat to open it up. 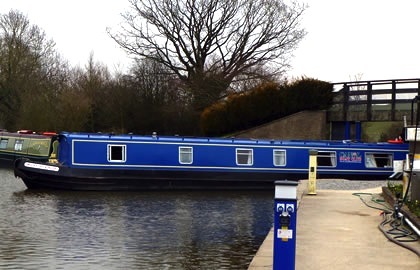 You can moor up for refreshment aftera couple of hours cruising by Halls lane bridge 12, and take the track to Ravensmoor where you will find the Farmers Arms serving real ale & meals. Turn left at Hurleston junction onto the Shropshire Union Canal, you will follow the reservoir for a short while. At Barbridge you reach the junction of the Middlewich branch of the Shropshire Union, but you carry straight on and head towards Chester, you are joined by a busy road until it turns away at Calveley. There is a bar & grill at Barbridge. At Bunbury Wharf, 2 staircase locks require thought before action, they are 14 feet wide like all subsequent locks between here and Chester. The village of Bunbury is 1 mile south west of the Locks and has stores, butcher & take away fish & chips & a couple of pubs. Bunbury water mill is up the hill from Bunbury Wharf, & is open Easter-Sep & gives guided tours around its fully restored watermill. You can moor up for the night at Beeston Broom Bridge 107, there is the Beeston castle Hotel here. It is 7.25 cruising hours to here. From Wharton Lock is an excellent view of Beeston castle- a massive ruin dating back to the 14th century which is visible from 30 miles away. The castle was built by the Earl of Chester in 1337, & is situated on the top of a steep hill dominating the surrounding countryside. It is open April to September. Beeston Castle is also known as the the formidable ‘Castle of the Rock’. Climb to the top of this impressive crag with incredible views over eight counties, from the Pennines to the Welsh mountains. Legend has it that Beeston still guards King Richard II’s lost treasure – maybe your family can find it? An exciting exhibition details the secrets of 4,000 years of Beeston Castle’s history, from Bronze Age settlement to Iron Age hill fort, the Castle itself was begun in 1225. With over 40 acres of unspoiled woodland trails to explore and an abundance of wildlife Beeston Castle and Woodland Park makes for a truly exhilarating and enchanting day out for all the family. The Canal continues through the flat but green Cheshire landscape, the Cheshire cycleway following the canal here, and continues all the way into Chester. Off to the left by bridge 113 there is a pub- the Poachers Pocket. Continue through the quiet countryside there are no stores until you get to Waverton where there is a shop. Just past Waverton off to your left was the site of the Battle of Rowton Moor in 1645, where one of the last major battles of the Civil War took place, with the Parliamentarians beating the Royalists. 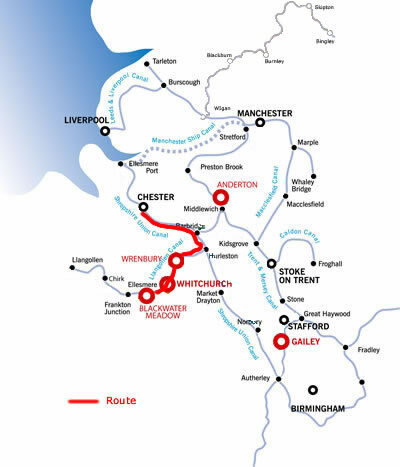 You are now on the outskirts of Chester and some of you may wish to moor up here and turn around at Christleton, near bridge 121, near the Cheshire Cat pub, thus saving 6 hours of cruising time to negotiate the 10 locks down into Chester and back. There is a very convenient Park & Ride here which can take you into the city of Chester in a few minutes. It is 3 hours and 15 mins cruising to here. There is a wealth of things to do in this Roman City which can be seen on foot, because of the amazing survival of the old city wall. You can walk right round Chester on this superb footpath. Handel gave his first public performance of the Messiah here in 1742. Discover 1,000 of shops behind the façades of the black and white buildings, find high street brands to designer boutiques. Shop in Chester's Rows where 21st century stores thrive in a Medieval setting. Take home some Cheshire cheese which is one of the oldest recorded cheeses in British history and is even referred to in the Domesday Book. Discover 2000 years of Chester life in the Grosvenor Museum see the impressive collection of Roman tombstones and displays depicting Roman Chester - look out for the Roman soldiers on the way. Discover the world of the famous naturalist Charles Kingsley and explore 'hands-on' the geology and natural history of the area. Also visit the Cheshire Military museum situated inside the tower of Chester castle. Little of the Castle remains but the 13th century tower is open to the public. Grosvenor Park miniature Railway is one of Chester's premier attractions for 9-90 year olds!. Open April to Oct Sat Sun & school holidays, where you can experience this steam railway laid out in the Grosvenor Park amongst the ducks, moorhens & geese. It is 21 hours cruising back to Blackwater, so cruise for about 7 hours per day & you should be OK!